A Geek In the Kitchen: The Bread Baker's Apprentice Challenge! So in addition to just finding a place to share stories and recipes from my life, one of the other reasons I started this blog was to post results from what is being called the Bread Baker's Apprentice Challenge. 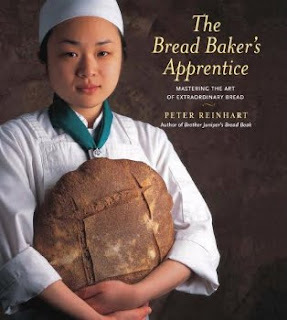 A food blog I follow called Pinchmysalt.com issued a challenge to readers to obtain Peter Reinhart's The Bread Baker's Apprentice: Mastering the Art of Extraordinary Bread, and work through the recipes, and then come together as a community to help each other out as they went. The book covers old world techniques and learning the art of dough and bread making. Lots and LOTS of really yummy recipes and I'm looking forward to working through them and of course posting my results as I go! My first experiences with fresh homemade bread came from dinner at my Godmother and Godfather's home. Good friends of my parents, we would visit with them fairly regularly when I was younger, and my Godmother, trained as a chef, would prepare the most amazing meals. This meant that bread with dinner whether loafed or rolled was always fresh and hot out of the oven. Some of my fondest memories of bread are sitting in her kitchen enjoying a piece of something she just baked. The amazing smells filling that kitchen are unforgettable even to this day. And while I've tried my hand at bread a time or two, I've never felt competent. Part of that of course is just more practice, and at this point, I can definitely make something edible and reasonably tasty, but I'd really like to turn it up a notch. I've never made things like bagels, or even French bread. And I've really wanted to find and make the perfect cinnamon roll recipe. I'm excited to try my hands at things I never would have thought to try, and I'm looking forward to really learning the process. Yay for Costco memberships and ingredients in bulk! At this rate, I may not have to turn on the heat this winter which will be an additional cost savings in this process. It's the season for bread! I definitely need to go back to my Break Maker's Bible and start in on the baking. I can't wait to reap the benefits of your hard work (and to give it a go myself...you know...once I'm in a country that actually HAS ovens).